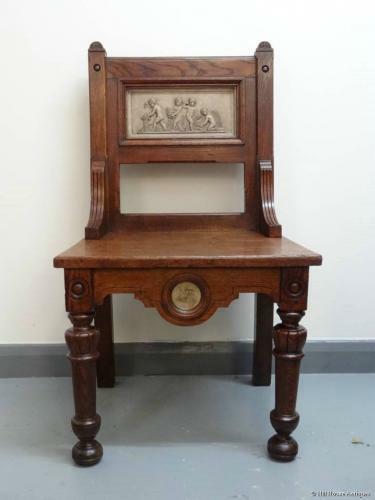 A charming excellent quality Arts & Crafts late Victorian period oak hall chair; possibly by Gillows or Marsh Jones & Cribb (or very similar). Two plaster/earthenware panels; top one of putti/children playing and lower circular one of winged putti with trident astride a dolphin; c1880`s. Approx 36" overall height, 20" wide, 18" depth. Height to seat 17"
The panels are Royal Copenhagen bisque plaques after the famous Danish scupltor Bertel Thorvaldsen (1770-1844), later manufactured by P Ipsen Enert in the late 19thC. (stamped to backs).